A beautiful photo of a Bald Eagle with his yellow eyes peeled on something below while flying above the waters of Homer, Alaska in the USA. Flying above the waters of Homer, Alaska is a place where these massive birds are found every year with the best viewing months being January, February and March. Here, the Bald Eagle can reach speeds of between 35 - 44 miles per hour while flying but only about 30 miles per hour if carrying a fish. The massive wingspan on an adult Bald Eagle reaches anywhere between 72 and 96 inches with the females being larger in width than the males. A female is also heavier than the male with a weight of about 12.8 pounds while the male only reaching about 9 pounds. 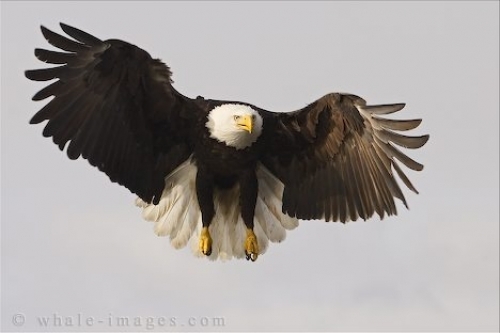 As the Bald Eagle prepares to swoop down on a fish or prepares to land atop an old growth or mature tree, the wings begin to curl at the ends and the sharp, yellow, taloned feet become positioned. Once the Bald Eagle captures his prey, he will feed on it by holding it with one claw and ripping at the flesh with the other one. An extremely powerful bird, the Bald Eagle does not fear anything except for humans and will fiercely defend themselves if any threat is felt. The only trouble the Bald Eagle has to deal with on occasion is a raccoon or great horned owl which is a threat to the nestlings. As Spring nears its end, the Bald Eagles make their departure from Homer, Alaska as more human activity comes into play and the fish move forward, but they return every winter. About half of the Bald Eagles found throughout the world can be seen in Alaska with British Columbia being another prime viewing area. The Bald Eagle is recognized as a sacred bird in many North American cultures with their feathers being a big part of religious and spiritual beliefs. When seeing a photo like this of this beautiful bird, one can understand why many humans have such a high regard for the Bald Eagle.